Kiev, July 8, Interfax - The Holy Synod of the Ukrainian Orthodox Church made the decision to elect its new leader on August 13. Kiev, July 8, Interfax – The Holy Synod of the Ukrainian Orthodox Church made the decision to elect its new leader on August 13. 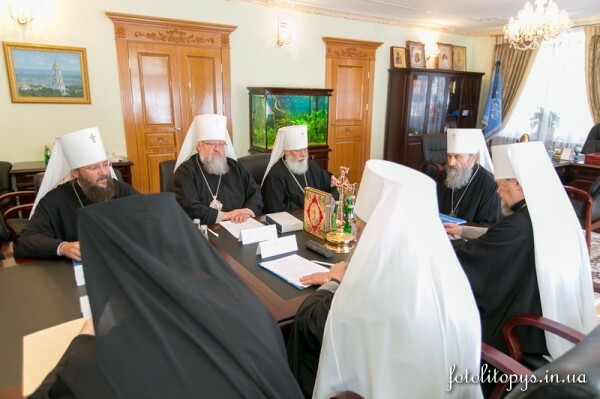 “The Holy Synod of the Ukrainian Orthodox Church met on July 7 under the chairmanship of the Locum Tenens of the Metropolitan See Metropolitan Onufry of Chernovtsy and Bukovina, and made the decision to call the Ukrainian Orthodox Church’s Bishops Assembly in Kiev on August 13, 2014,” the Ukrainian Orthodox Church said on its website. Speaker of the Ukrainian Orthodox Church Archpriest Georgy Kovalenko said this process does not involve canvassing or polls. “Election of the primate does not involve an election campaign, canvassing, debates, presentations, or polls. Therefore, we hope the bishops, clergy and the flock will refrain from making forecasts, or commentaries,” Archpriest Georgy wrote on Facebook. Leader of the Ukrainian Orthodox Church Metropolitan Vladimir (Sabodan) of Kiev and All Ukraine died on July 5. He was leader of the Ukrainian Orthodox Church of the Moscow Patriarchate from 1992 to 2014. On February 24, 2014, Metropolitan Onufry (Berezovsky) of Chernovtsy and Bukovina was elected Locum Tenens of the Kiev Metropolitan See.